Rounding out the news coming out of IFA 2012 Wednesday is an announcement by Qualcomm that its Snapdragon S4 processors are powering Samsung's newest smartphone and tablet. , running Microsoft's Windows RT, both feature the punchy processor. Snapdragon S4's inclusion in the Ativ S continues Qualcomm's reign as the sole supplier of processors for Windows Phones. 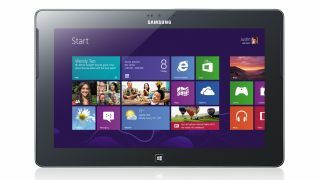 Samsung's got the Windows 8 and Windows Phone 8 device wheels in motion thanks to its mid-week unveils. Most expected Nokia to be the first to debut a Windows Phone 8 during a Sept. 5 event, but Samsung beat them to the punch with the Ativ S, a durable device with a not-so-little 4.8-inch screen. The Ativ Tab, aside from Microsoft's own Surface, is really one of the first slates to poke its head out. The world will have to wait to grab either device - when exactly that'll be we don't yet know - but with the OS dropping in late October and we don't expect Samsung will keep everyone itching for that long.